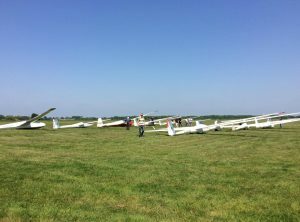 Flying report 5/6/16 – Lots of launches! 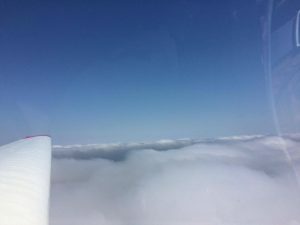 Today’s flying started early but to a rather low cloud base. Finding big enough gaps in the cloud was the trick. The whole club fleet was taken to the west end to launch into a moderate easterly. 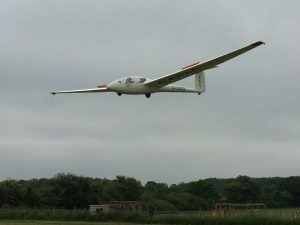 Initial launches were cable-break practice towards aircraft conversion and pre-solo training. The cloud-base didn’t vary much early on but it started to break up to reveal blue sky albeit with a low-ish inversion. Once we were able to launch to full height, a number of private aircraft began to show up at the launchpoint including an LS8, LS4, ASW28 and a Sport Vega. 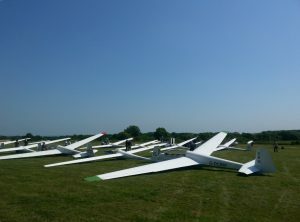 By early afternoon it was a busy cycle at the launchpoint due to the weak soaring conditions. 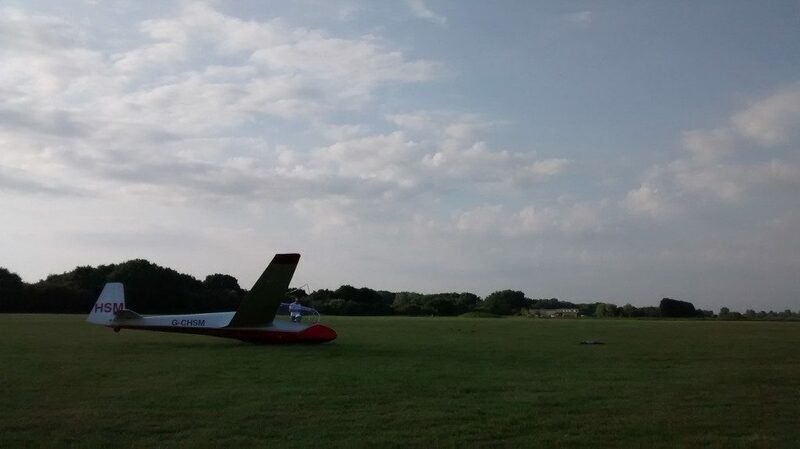 Kit B had a good flight in the club’s Astir CS77 and several others managed to climb to over 2,000ft. 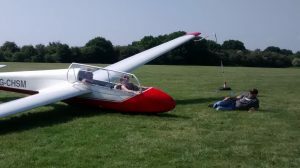 After being put through the mill in the K21 by Barry K, Peter C was converted onto the club LS4 G-DEMG which he apparently rather enjoyed flying, having three flights including soaring. Others who hadn’t flown recently were given check flights and the cycle of annual flying checks was well under-way (more SCBs!). 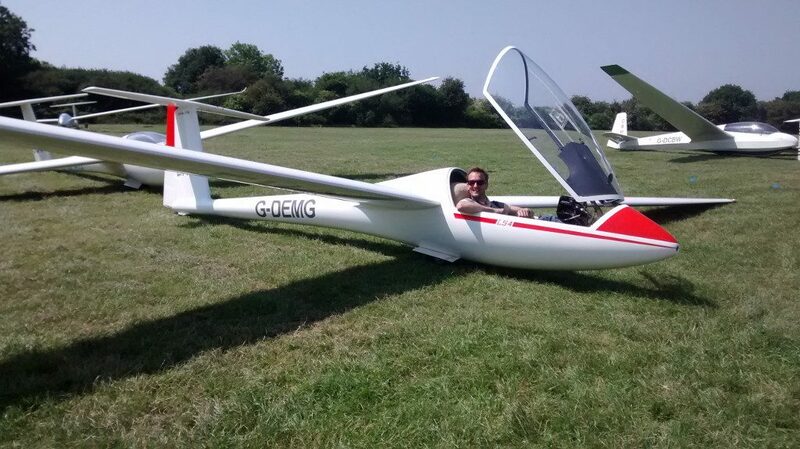 Catherine J took several flights with CFI Steve B and re-soloed on K13 G-CHSM having previously been a solo glass pilot at other clubs. 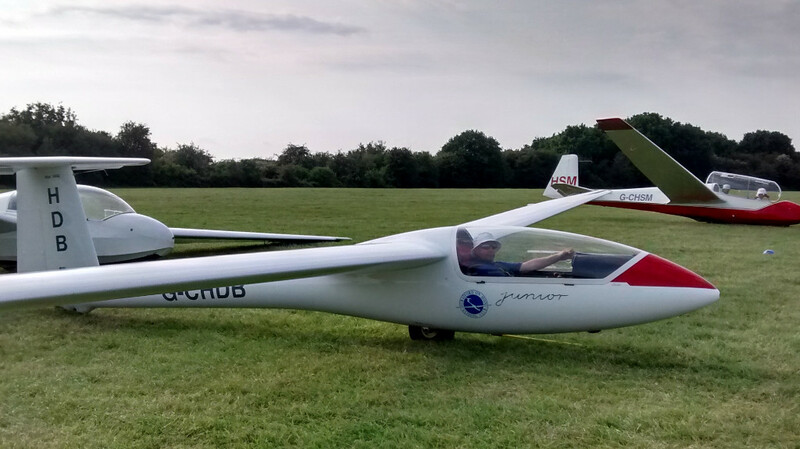 David G also took a couple of flights with Steve B and coverted into the club’s SZD Junior G-CHDB, his first glass single-seater! The day was warm, nowhere more-so than in the Skylaunch cab which left winch-drivers wilting towards the end. Many thanks to Tony M who put in another epic session getting us all launched. 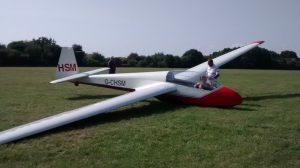 Visiting pilot Outi from Finland had the last flight of the day in G-CHSM with Steve H.
After just missing 60 launches a few weeks ago, Steve B reckoned we’d make it today and we in fact managed 66 winch launches which we think is the highest day total this year. This entry was posted in Flying reports and tagged conversions, flying report by admin. Bookmark the permalink.